COCONUT GROVE (Dan Trimmer) Tetraploid (Sdlg. x Ice Cream Emperor) 30" EM Re. Ev. 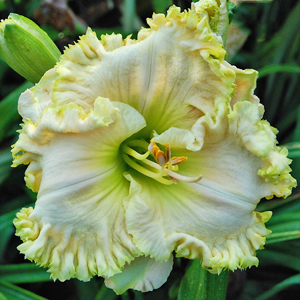 51/2"COCONUT GROVE is a magnificently round, ruffled and sophisticated cream ivory self with a green throat. Circular blooms are very consistent presenting perfect blooms day after day. 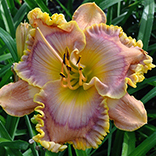 The plant is compact with arching foliage and tall erect scapes present the beautiful flowers to perfection. It is pod fertile and hopefully will lead to beautiful white seedlings for me next year. Typical bud count is 18-20.